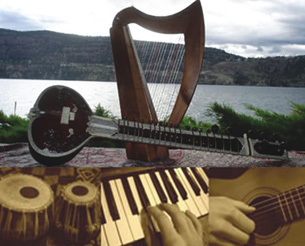 Indian classical ragas have been acclaimed to have healing effects. They stimulate the brain, ease tension and remove fatigue. The effect of Music Therapy may be immediate or slow, depending upon number of factors like the subject, his mental condition, environment and the type of music selected for having the desired effect. Music Therapy largely depends on individual needs and taste. The use of music as therapy is based on scientific and clinical approach and has to be used with great care and deep study of the nature of illness. Before using music as therapy it must be ascertained which type of music is to be used. The concept of Music Therapy is dependent on correct intonation and right use of the basic elements of music. Such as surs (notes), rhythm, volume, beats, and piece of melody. There are countless ragas of course with countless characteristic peculiarities of their own. Different ragas are applied in different cases.